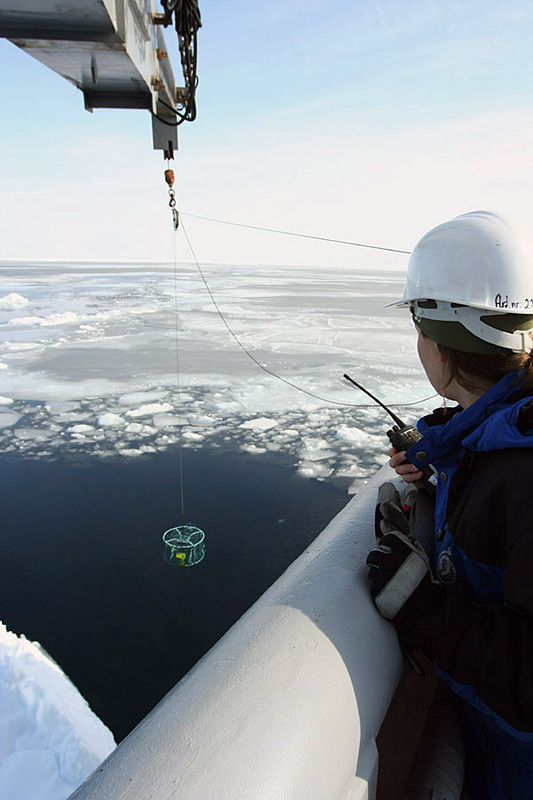 The first two days of this leg were spent taking temperature and salinity profiles in a region of fairly open drift ice. This is bread and butter oceanography and with ideal weather conditions we’ve been quite relaxed. The water is about 2.5 km deep so it takes roughly two hours to lower the instrument to the bottom and back -allowing plenty of time to ponder the data. The water is extremely clear here as there are very few plankton and almost no suspended sediment. 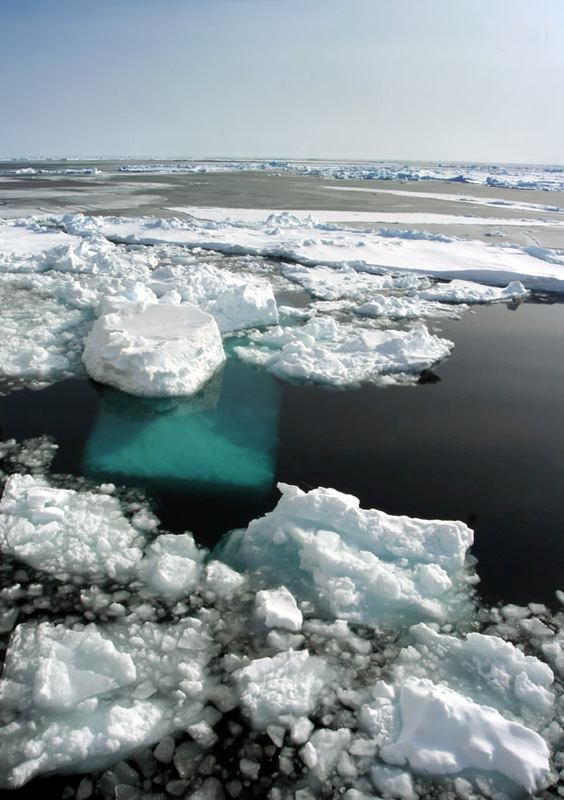 As a result it’s often possible to see the underwater part of ice floes which appear bright turquoise. The second photo shows Laura preparing the instrument package to be deployed, and the last hand photo shows the instrument package abut to surface after a trip to the bottom. Here (as promised) is a series of photos showing how we broke the ice around the Noorderlicht in Templefjord. Although the ice was not much more than a meter thick it was quite an operation to carefully break the ice without damaging the Noorderlicht. 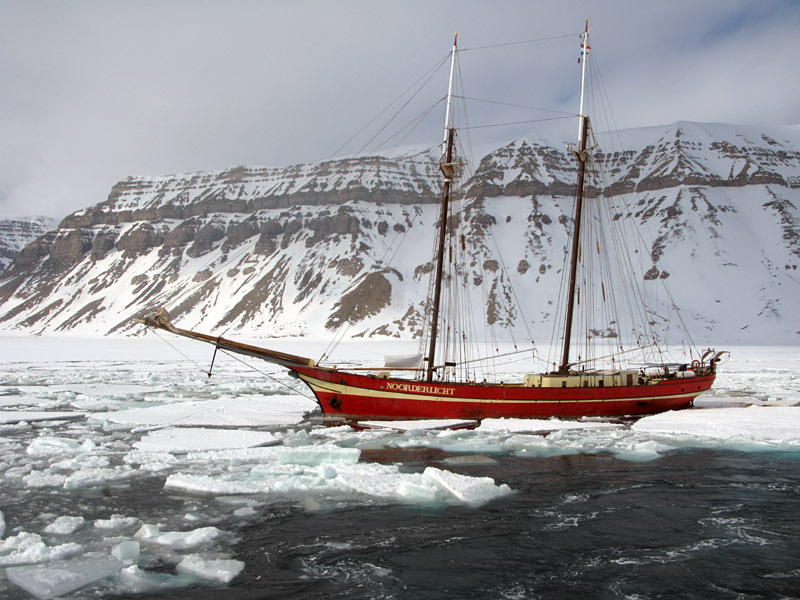 The basic strategy was to make circuits around the Noorderlicht until a crack made by the KV Svalbard reached one side of the Noorderlicht. Then the process was repeated from the other side so that a circle of ice containing the Nooderlight was split in half and the ship was released. The operation was not all that easy with a ship as big as the KV Svalbard and took several hours. 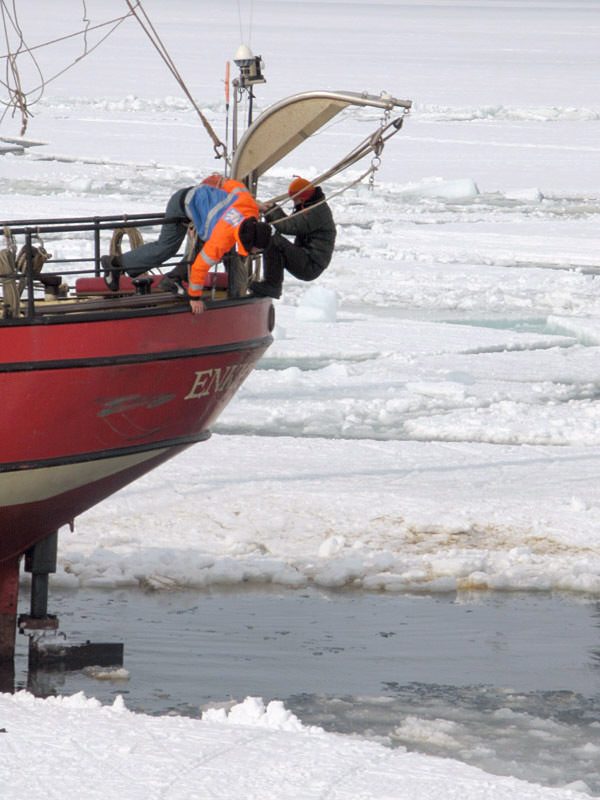 At one point a big piece of ice collided with the Noorderlichts rudder and threatened disaster – this is why the Noorderlichts crew are desperately trying to look under her stern in one picture! Fortunately the rudder was quickly repaired and all ended well. 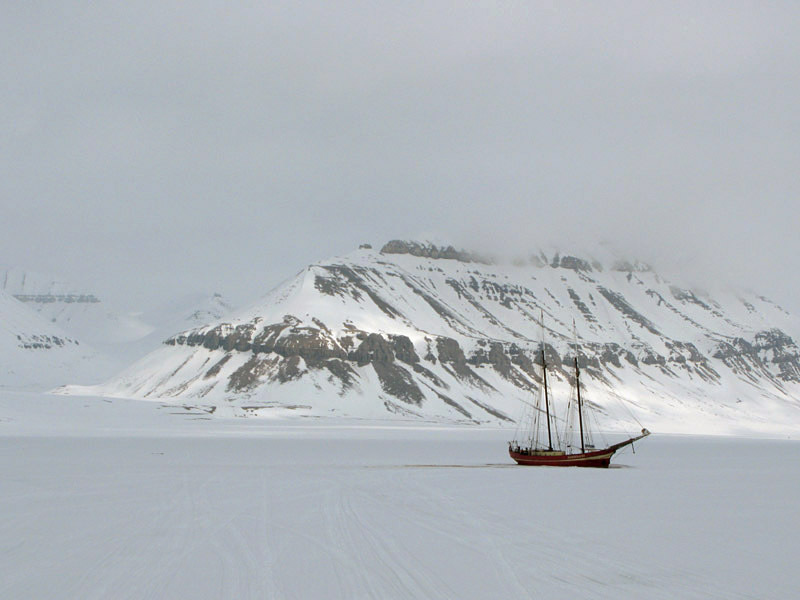 The last image shows Barentsburg as seen from the KV Svalbard when we steamed past it this evening! After a few days of quite hard work, yesterday provided a welcome opportunity to relax. 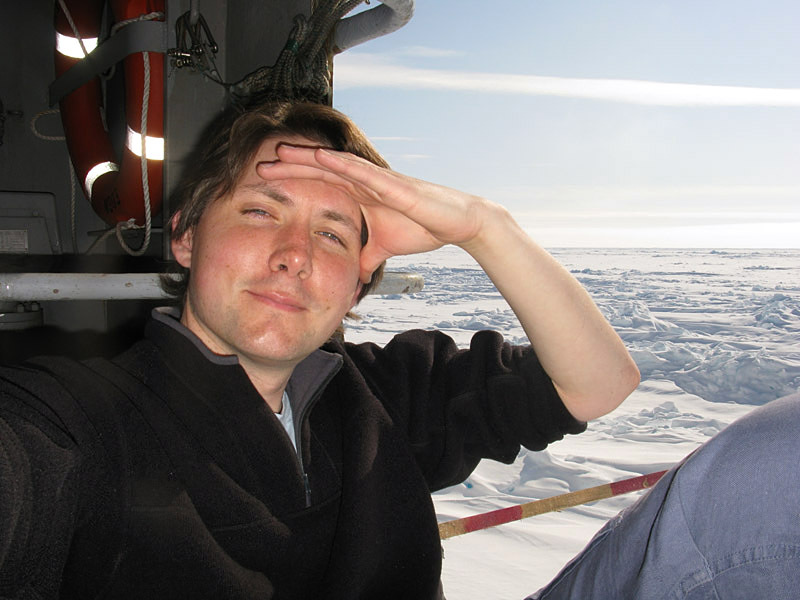 The ship moored to an ice floe where it stayed for two days while the oceanographers continued to explore Eastwards by helicopter and the sea-ice people and the biologists studied the ice floe the ship was moored to and the things living underneath it. As there is only space for three people in the helicopter I reluctantly stayed behind on the ship (it was a stunning day for flying.). Even worse, as one of our instruments only works with my laptop and not anyone else’s I had to let the helicopterists take my laptop with them. Without a computer I couldn’t do much more than label and organise sample bottles for leg 2, but that was actually not such a small task. Anyway, I had the opportunity to soak just a few rays in a corner sheltered from the wind at lunchtime. 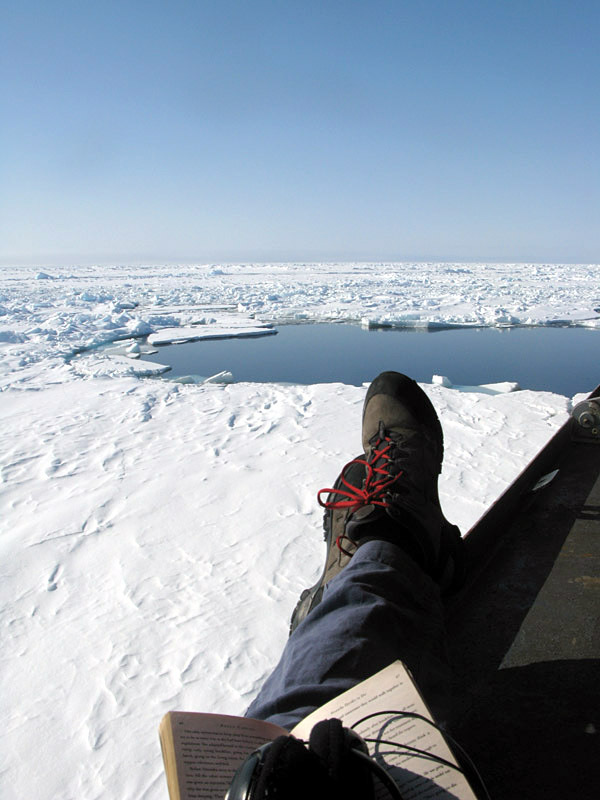 It’s pretty rare to have more than a few minutes of free time even when spending two months on a research ship as there’s almost always something that needs to be done. We were under siege again (excellent!). In the photos you can see the bear approaching. 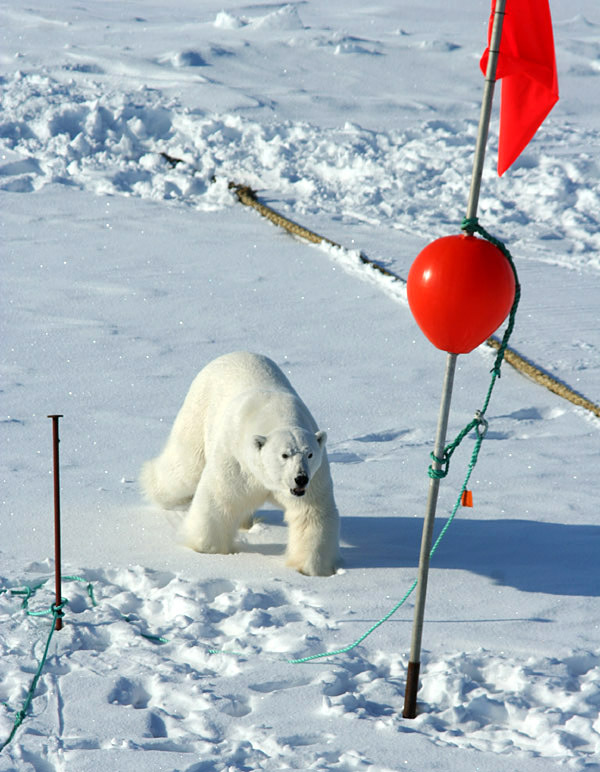 As the beast was heading vaguely towards the gangplank the bridge tried to scare it with the ship’s horn (which is truly deafening) but the bear responded with an expression that looked more like anger than fear and sank its teeth a little deeper into one of the biologist’s mooring buoys! This float is nearly a meter in diameter and I was pretty amazed the bear could open it’s jaws wide enough to bite into the curved surface, but that didn’t appear to be a problem! After a while the bear wandered a little further away and then nonchalantly swam across the wake of open water that the ship left as it broke the ice on the way here! 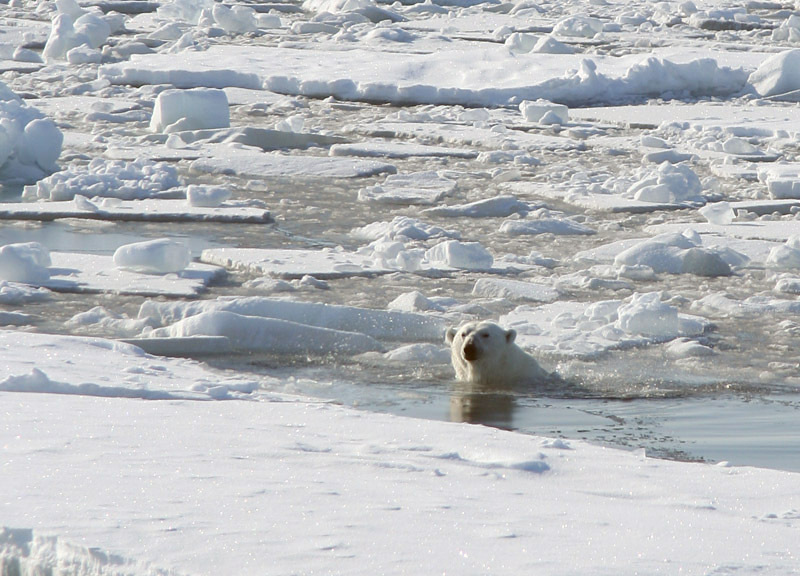 Apparently polar bears don’t think twice about a quick dip in -2 degree water. The good weather lasted until late in the evening and yesterday ended in a spectacular sun-almost-set with a thin fog developing over the ice. This morning the this fog was still hanging over the ice seemingly just a few meters deep, so I hurriedly donned my flying suit and packed a lunch box. Sadly two hours later the fog had still failed to burn off, and the conditions were changing from just-not-quite-good enough-weather to plain old bad weather, so after lunch I accepted I’d probably flown for the last time on this leg and hung my suit up in the hanger. Around dinner time though things began to improve and it looked like my flying sandwiches wouldn’t suffer the indignity of being eaten at the dinner table after all :). So got dressed again, jumped into the helicopter and made a bee-line for our last planned station. It was quite a nice flight over huge areas of dark nilus ice that’s almost clear enough to see through, but before we reached our station the windscreen (is that the right term?) began to frost over! so we rapidly descended to a low altitude and re-traced our bee-line back to the ship. We’d measured everything we wanted except for these last two stations. 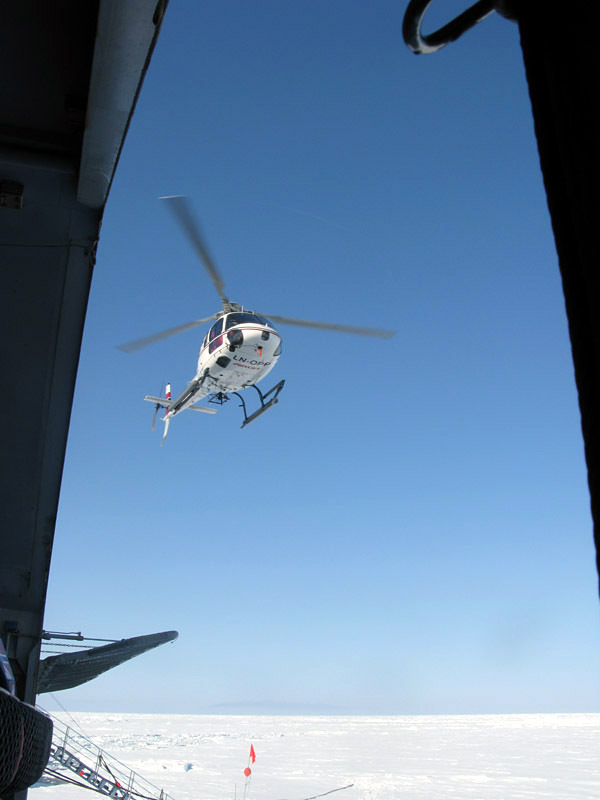 As the helicopter touched down we decided it was probably best to call an end to leg 1. 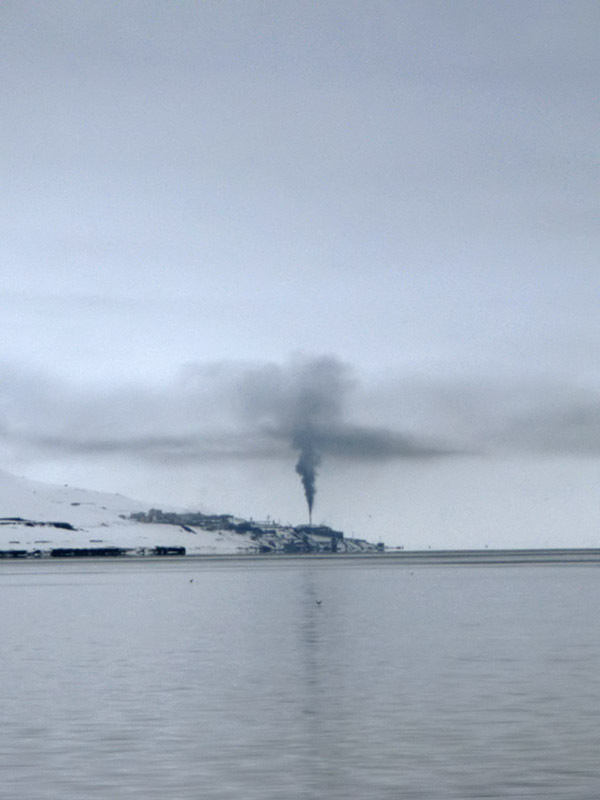 As I write this the ship is extracting itself from the ice flow we were moored to (no dynamite this time) and turning the sharp end to point at Longyearbyen. We should arrive in about two days, at which point I’ll be reunited with Hanneke, who is currently sitting in a plane heading to Tromsø.